When it comes to planners, and we mean physical, hold-in-your-hands, real-paper planners, there are so many options that it’s easy to go with no option at all. But truthfully, by giving into analysis paralysis, you’re missing out on the huge benefits of going paper—namely, increased productivity, better organization skills, a happier life, and so on. In order to make this decision easier for you, we’re doing a this vs. that series, planner style. Each round will compare the pros and cons of two of the best planners of 2018, so you can make the decision that works for you and your needs. Ready for round one? It’s Passion Planner vs. Panda Planner Weekly*. Both Passion Planner and Panda Planner will set out a path for you to tackle your everyday tasks, as well as your long-term goals. They’ll also help you prioritize what’s important and plan out your days, weeks, and months. What’s the difference between these productivity tools? Well, it turns out, quite a bit. It just depends on what you’re looking for and what works best for you. So part of this is an activity in knowing yourself. What’s Special About These Two Planners? Before we jump in, you should know one thing: These are not your average planners. The ones you can pick up at the store have lots of blank space and little direction. While that works for some people, others need more structure, especially if they’re struggling to get organized, work through a mental health issue, or just recognize the good in their lives. That’s where these planners really come through. Both Passion Planner and Panda Planner Weekly give you the structure to stay focused, get organized, and prioritize your goals. But each has their own unique way of doing so. In our opinion, one of the key differences between the weekly versions of the planners involves your end-goal. Are you looking for a place to turn dreams into reality? Or are you in need of stress relief, work-life balance, and concrete, research-backed ways to build your happiness? To help you through these questions, let’s take a look at some of the planners’ basic features and intentions. Price: The weekly Passion Planner we used for this review is $35.00, plus shipping and handling, though the price depends on the color to some extent. Cover design: The rose gold option we chose included an engraved cosmic design on the cover. If aesthetic is important to you and encourages you to stick with it, Passion Planner gives you plenty of options. Internal layout: The Passion Planner is divided into three main sections: Monthly Layouts, Weekly Layouts, and 40+ Blank and Grid Pages for creative space. There’s also a folder flap at the end of the planner to stick in pictures or other papers. Price: Panda Planner Weekly wins the price category: It’s only $25.97 (add shipping and handling). Cover design: This version only comes in one color: black, though the classic and pro versions come in other colors (e.g., orange, cyan, and purple). It also includes an engraved Panda on the cover for a simple, but classic design. Internal layout: Panda Planner is divided into two main sections: Monthly Section and Weekly Section. (There is technically a Daily Section as well, but it’s interwoven through the weekly one.) There are blank pages dispersed within the weekly section for creative space. The last five pages of the journal include a blank note section, as well. This planner also has a folder flap. One additional feature? It has three ribbons that allow you to easily switch between the weekly, monthly, and notes sections of the planner. Passion Planner only has one. The Passion Planner starts you off by revealing their “passion planning” process. It’s a step-by-step method to turn your dreams into reality through actionable strategies. The goal is to help you prioritize what you really want to do in order to live your best life. As you go through the process, you’ll also get an explanation of the psychology behind “passion planning”. Once you start using your planner, you’ll know the specific and critical steps to reach your ultimate goal. This passion plan gives you the know-how to start mapping out your goals effectively. Want a little more help? The Passion Planner Youtube channel teaches you a few fun ways to use your planner. Panda Planner Weekly opens with a one-page introduction giving you the basic steps to get started with the planner. It also invites you to access its free video mini-courses at MyPandaPlanner.com, a membership site exclusively for Panda Planner users. This supporting content will give you guidance on topics like goal-setting, happiness, positive psychology, anxiety, stress, and gratitude. In other words, it tells you why the planner includes certain activities and sections, based on science, and helps you get the most out of it. Now that we’ve reviewed how to get started, let’s take a look at each section in more detail. First order of business when using your planners? Scheduling out your month. Here’s how each planner takes on your next 30 days. A “mid-year passion roadmap,” which aims to reset and renew your passion plan. An “end of the year reflection,” which helps you realize how you changed in the past year. A monthly focus and habit to build: Every day you do your daily habit, you can tick the “H” box. This uses the “Don’t Break the Chain” technique to create momentum with your habit. Now that we know how each planner sets up your month, it’s time to get into the nitty-gritty of your week-to-week. Let’s take a look at their approaches. Panda Planner’s weekly section is more detailed. Every week, Panda Planner Weekly trains you to review your prior week and plan the next. The weekly section consists of four, repeated pages. The first two pages help you review and plan, and the second two pages break down those plans into your week. One page to journal, reflect, and be creative. This can help you brainstorm your projects and priorities for the week. What you want to focus on in your personal, professional, and relational areas of your life (i.e., partners and friends/family). This helps you identify what’s important to you and bring focus to areas of your life that might be lacking. Four projects for the week. Your top five goals for that seven-day period. A place for a positive habit you’re trying to build, such as exercise, meditation, journaling, etc. A designated space for your weekly focus. This can be on any part of your life—family, friends, or work. Just like the Passion Planner, your weekly focus is in a prominent position on the spread. A place to record two challenges that might get in your way of accomplishing your goals. It helps you identify your roadblocks so you can develop a plan to overcome them. A designated list of tasks for the week. The tasks on this list can be placed into the day-by-day breakdown, similar to that of the Passion Planner. A notes section for any ideas or thoughts that come up during the week. A gratitude exercise and “I’m excited about” section to complete in the morning. Your top three priorities for the day. These are the MUST-DOs to keep you moving toward your big goals. Hourly breakdowns that help ensure you have time planned for your top three priorities plus any other events of the day. An end-of-day review: Write down three wins of the day and one way you can improve. Where Can I Get Creative? Now that you’re familiar with the structure, let’s talk about where you can break away from it. In other words, places to get creative. The Passion Planner gives you 40+ consecutive pages to get creative. Consequently, this is the planner for you if you want space to let your ideas freely flow without limitation. You can use the space to daydream about your life, passion plan, journal, reflect, or even just draw. In contrast, Panda Planner Weekly’s creative space is scattered in single pages and small sections throughout the planner. To some, it might seem limiting to condense all your ideas onto just a single page each week. However, there are note pages at the back of the planner that give you a bit more room, but there are only a handful of them. 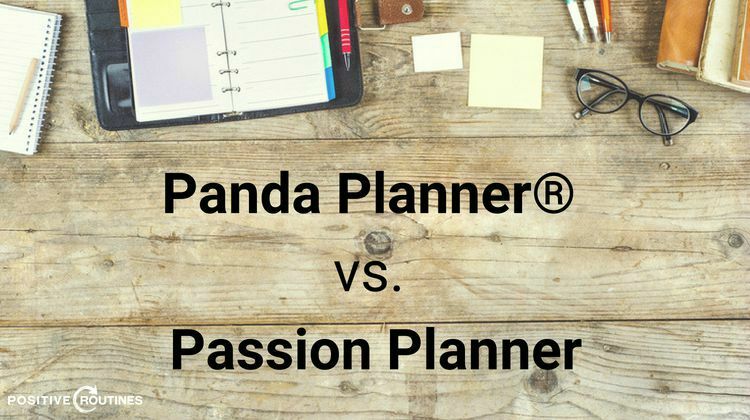 What’s better: Passion Planner or Panda Planner? If you want to lead your life with productivity and with intention, both planners will help you do the job. But there are some differences. On the one hand, Passion Planner focuses on making big dreams happen by giving you a system for identifying key goals and then helping you break them down into actionable steps. On the other hand, Panda Planner uses science to help you build positivity and gratitude for the life you already have while helping you get closer to the life you want. It does this by encouraging you to build balance in all areas of your life, helping you refocus your energy and emotions to improve way more than productivity. Ultimately, the planner that works best for you comes down to your needs, goals, and understanding of how you operate. We hope this review gave you enough information to bite the bullet and join the world of paper planners. As you can see, there’s a lot more going on here than merely organizing your schedule. With the right tool, you can build a more meaningful life. And isn’t that what we’re all here for? Your turn: Passion Planner or Panda Planner: What one would work best for you? Tell us what planner you picked and why in the comments below. Nadia Chaudhry is an SEO copywriter and content marketer. She’s all about growth in business and life. No surprise, she loves to write about personal development, productivity, e-commerce, and marketing. But first, pilates. Follow her on Twitter @NadiaChaudhry. Love the comparison of passion vs panda planner. Funny, but I compared the two prior to reading this. Ended up with panda planner for myself and passion planner for my 33 year old daughter. Very cool! I love my choice!! Thank you so much, Elizabeth! It’s certainly interesting to compare various features of the planners that are out there and figure out what one works best for you. It seems like you made the right choice for both you and your daughter, and we’re glad they’re working out. Thanks again! I used the Passion Planner for the last 2 years but they no longer offer their dated smaller size, which fits in my purse. Two main goals for me in a planner, 1) fits in my purse 2) hourly appointments. 3) dated. So I turned to Panda this next year for 2019. Wait…they don’t offer a dated version (which bums me out), but by the time I looked over their product, I ended up with their larger weekly view. Yikes, I compromised on 2 on my priority list (! ), but I am going to try it out for a year. Thanks for the comment, Fleur! Let us know how it’s working for you. Thanks for the comment, Sherry! We’re so happy you found something that’s working for you. We all need a little more positivity in our days, so we’re happy the planner can help you get more of it. Thanks again and happy planning! Re pricing, the Pamda Planner lasts for only 3-6 months so it might not be the most economical. Please consider looking into the pricing of panda and revising your article. Thanks for the comment, Veni! You’re correct that the Panda Planner only lasts for 3–6 months, which will require you to purchase one mid-year. However, there are other perks that come along with the Panda that don’t exist with full-year planners. We’ll add a line to clarify. We hope people make the decision that works best for them, and we hope you will too. Thanks again!